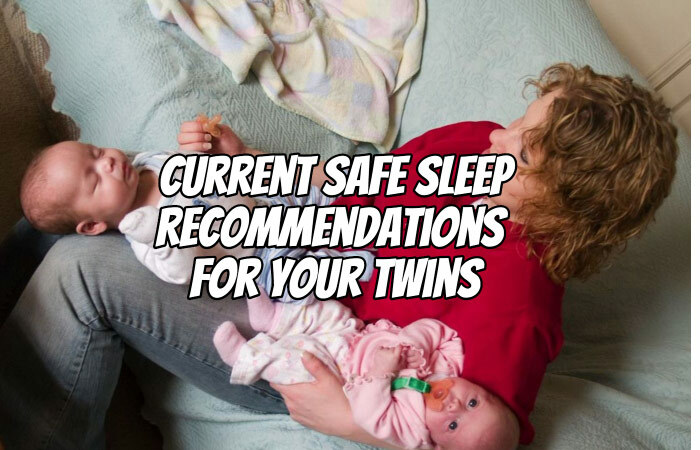 As the safety of your twins should be the most important thing at the top of your list, I wanted to share the current sleep recommendations for your twins from the American Academy of Pediatrics. These recommendations include how to keep your babies safe during the night when they’re sleeping, as well as during nap time. The American Academy of Pediatrics does research into the best practices to keep your babies safe. The big risk that they’re trying to address with these recommendations is sudden infant death syndrome or SIDS. As a parent you want to do the best that you can to keep from experiencing the horrible loss of having them pass away suddenly in the night. There are several things that you can do that are straight forward and that are easy to keep your babies safe when they’re sleeping at night or during naps. 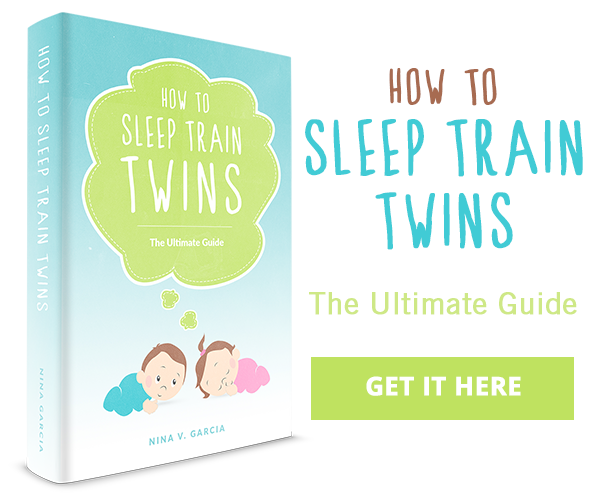 Let’s go through these sleep recommendations and the implications that they have for you, as parents of twins and how you can best accomplish these in your home. The first guideline from the American Academy of Pediatrics is always place the baby on his or her back on a firm, flat surface such as a crib or bassinet with a tight fitted sheet. Maybe when you were a baby, your mom put you on your belly or on your side. We know now that babies are safest on their backs and that’s also true with your twins. When you put them down for nap time or when you put them down for bedtime, make sure they’re flat on their back on a firm sleep surface. You don’t want them to be on something soft or squishy like a sofa, a chair, or your bed. You want it to be a very firm, flat surface. A typical mattress in a crib is going to be great and you want it to have very tight fitted sheets to keep them as safe as possible. The next recommendation from the American Academy of Pediatrics is don’t use any kind of soft bedding in the crib with the babies. This is includes things like bumpers around the crib or blankets or pillows or soft toys like a teddy bear or dolls or anything like that. The crib has to be completely bare. It’s the mattress, a firm fitted sheet, and your baby. Those should be the only things in the crib. When you look at cute pictures of twin nurseries, the cribs always have very ornate decorations, blankets, pillows, teddy bears, and bumper pads. All those things can pose a risk for your babies when they are sleeping. Make sure that the crib is just the mattress, sheet, and your baby. The third recommendation is that babies share a bedroom with the parents, but not sleeping on the same surface. That should ideally be until the babies turn one, but at least for the first six months. The claim here is that this reduces the risk of SIDS by at least 50%. As parents of twins, there are some challenges with this recommendation. Having both babies sleep in your room, but not in your bed, does create some logistical challenges. I don’t know how big your bedroom is, but our bedroom isn’t really going to fit our bed and have room for two sleeping babies. You want to make sure that you’re not co-sleeping with your babies in your own bed because that surface is going to be too soft and there’s too much bedding or blankets that can cause some trouble. You want your babies to be on their own surface. It could be in a bassinet or it could be in a crib in your bedroom. Ideally, they’d be in your bedroom for at least six months (if not a year). The reality is that you may not have space for both babies to sleep in your room. In our case, our girls nursery was right next door to our master bedroom and so we put the girls in their own room from the time that they came home for the hospital. We simply didn’t have space for them in our room. There are other concerns you may have if your babies are in your room for a full year. 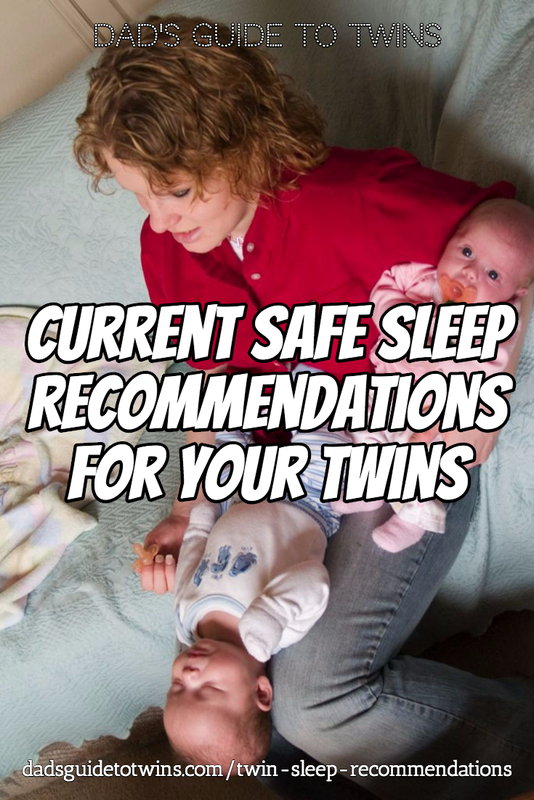 Your sleep is already going to be hampered a lot by caring for twins during the night. So, if they are sleeping in the same room with you, even when they are sleeping through the night (6-8 hours at a stretch), they will still disturb your sleep as you hear them through the night. Please make the sleeping arrangement decision in consultation with your pediatrician. Again, these are recommendations from the American Academy of Pediatrics recommending that your twins sleep in your room with you for at least six months if not a year after they’re born. Room sharing, of course, does give you easy access to take care of the babies during the night and to keep an ear and eye on them while you’re sleeping. Those pros are why overall it improves their chances of avoiding SIDS during the night. Another recommendation from the American Academy of Pediatrics is to avoid babies’ exposure to smoke, alcohol and drugs. These should be obvious. You know those things are not really good for you anyway and they’re definitely not good for your babies. So, you don’t want your twins sleeping in the same room with someone who is using those substances. Another recommendation from the Academy of Pediatrics is to offer a pacifier at nap time and bedtime. I know this is something that worked very well for our children and it helped them to self-soothe. The sucking motion on the pacifier really helps calm them down for sleep. Your kids are going to outgrow a pacifier. They’re not going to have it forever. Some kids may use it much longer than others into their toddler years and others may abandon it after several months as an infant. But you can always offer that as an option to help soothe and calm down your child before nap time and bedtime. It may be interesting to note, one twin may like a pacifier and one twin may not like the pacifier. The Academy of Pediatrics recommends that your babies get all the required vaccinations that are on the schedule that you’ll receive from your pediatrician. Avoiding the illnesses prevented by vaccinations helps keep your babies healthy and sleeping well. When your babies are not sleeping, another recommendation to help your babies sleep well and sleep safely is that you do tummy time with your babies during the day. If you aren’t familiar with tummy time, it is exactly that. You put a blanket on the floor or you put your baby on the floor on his or her tummy when they’re awake and they’ll start to try to lift up their head. They’ll try to move their head side to side. It helps build some of the strength of the muscles in their body that will serve them well when they are sleeping when they need to move around and stay safe. These are some of the recommendations from the American Academy of Pediatrics. 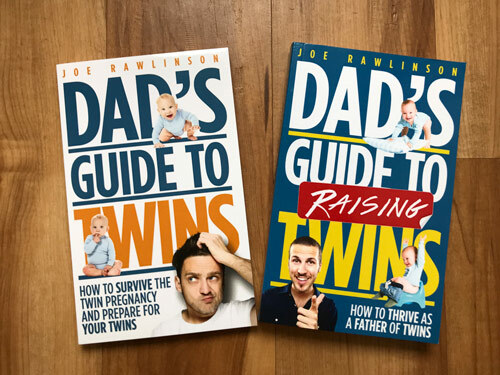 The big one that affects parents of twins is the recommendation to have your twins sleep in the same room as you for at least six months if not a year. Based on your logistics and the layout of your home and bedroom that may or may not be feasible. Always make a decision in consultation with your pediatrician on how you should be sleeping your twins.